It's October and a trekking group takes a moment to pause at the sign for The Thorong La pass, the highest point on the Annapurna Circuit trail system. Nestled in central Nepal, Thorong La pass reaches 5,416 meters above sea level (that's 17,769 feet). Looking downward, on either side are Tibetan villages built almost entirely of stone. The group gazes in exhaustion and disbelief at the snow-packed jagged peaks of the Annapurna Range towering just above them. The range has at least 30 peaks above 6,000m Meters with the the crowning peak standing at nearly 8,000 meters above sea level. The group prepares to continue onward. It’s an otherwise classical mountaineering trip, save for one unique feature. 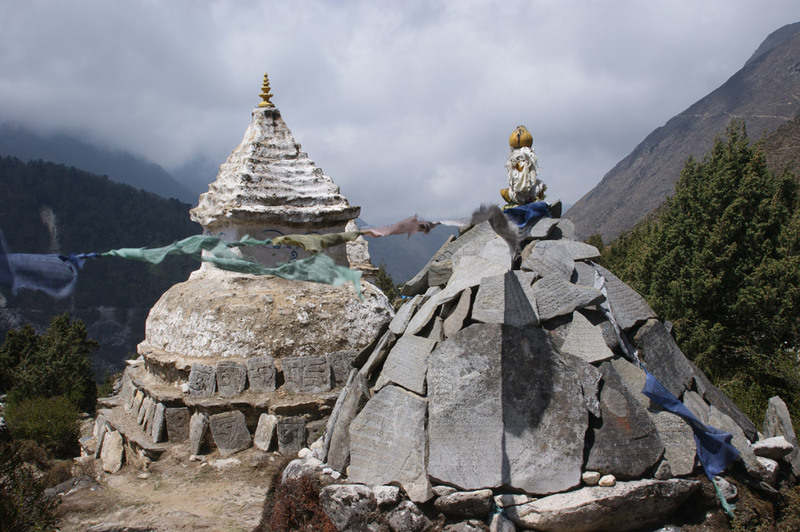 This trip is lead by female guides, a break from the norm and from Nepalese tradition. 3 Sisters Trekking, based in the city of Pokhara, is Nepal's first and only women-owned adventure guide company. 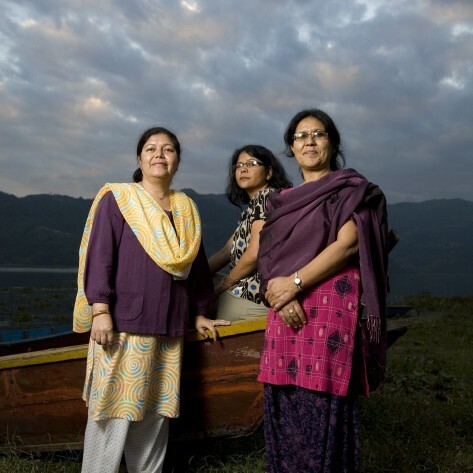 Nepalese women and girls travel from all over the country to Pokhara to work as 3 Sisters guides. But before they’re able to work they must go through a rigorous training process hosted by Empowering Women of Nepal (EWN), the company's non-profit extension. EWN offers free training for the women of Nepal in two to 6 month sessions. Trainees who enter the program learn skills to help both navigate the mountains as well as their future clientele. They learn first aid, map reading, waste management, leadership skills, and English in addition to mountaineering and trekking skills. Infographic by Sam Doge. Courtesy of The Telegraph. After their training is finished, 3 Sisters guides must complete a five month assistantship as field apprentices on actual mountaineering trips. 3 Sisters Trekking feeds its guiding profits and donations to the non-profit extension, EWN. This means that 3 Sisters Trekking is EWN’s biggest donor. The two programs work in harmony as graduates from the non-profit's training are then hired to work at the trekking company. This perfect circle has sustained itself for the last twenty years. In 2011, four women guides trained under 3 Sisters trekking summited the Annapurna IV which stands at 7,525 Meters or 24,688 feet. 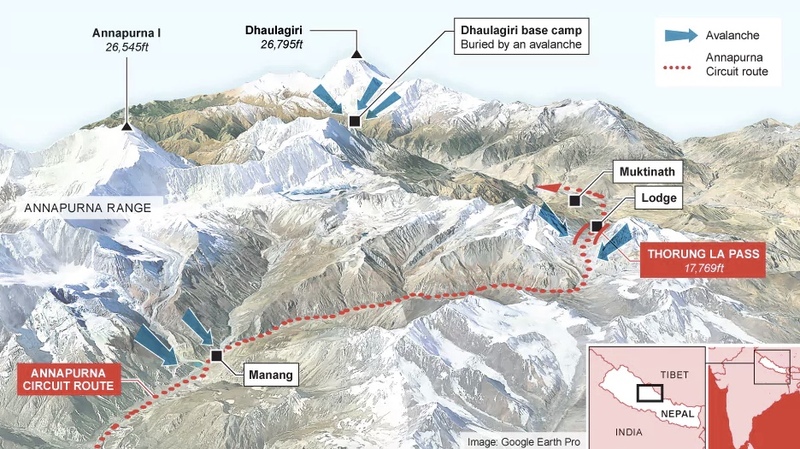 They were the first Nepali women on record to summit Annapurna. But long before this summit, back in 1993, the sisters ran a restaurant and lodge in Pokhara. At this time, only one sister, Lucky, had received basic mountaineering training. But after hearing rumors of abuse and harassment at the hands of male guides from female hikers, the three women decided to find a solution. It was then that the idea for a female-lead trekking company was first conceived. "We met women from all over the world and came across some with bad experiences with their male guides,” says Lucky. “These stories touched us and we resolved to do something . . . [W]e gathered up all our courage and entered into this uncharted territory." Shortly after, in 1994, 3 Sisters Trekking was born. "Our father gave us the freedom to choose what to do with our lives, and he taught us to care for the poor," says Nicky. “We three sisters benefited by growing up with an environment of gender equality in our home. We were three sisters and five brothers, our father always inspired all his children to get a good education. He treated all of his children equally and provided the same opportunities to all of us,” she says. Thirty years ago, the extent of tourism in Nepal was moderate, but in the 1990s the size of worldwide tourist occurrences multiplied twice. Now, tourism comprises the majority of the country’s GDP. Using tourism as a means of employment, the sisters connected tourism money with those that needed it most, the local women. "Women in Nepal are strong, but they suffer from gross inequality. They carry the weight of the caste system and the dowry system, and they have no status. We wanted to do something to change that. We love the mountains, so we decided to train women as guides." Left: Base camp in section four of Nepal's Annapurna region. 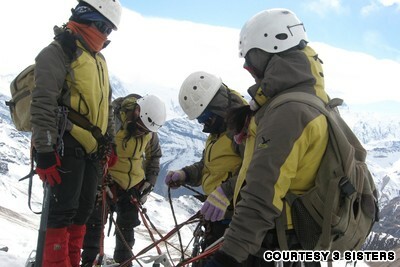 Right: Trainees with 3 Sisters work with the ropes during an expedition up Chulu West in Nepal's Annapurna region. We've chosen the Jomsom trek: 11 days' walking northwards from Pokhara, between the Annapurna and Dhaulagiri mountains to the Tibetan plateau and the temple village of Muktinath at almost 3,800m. We trek through forests of rhododendron and magnolia, along ancient stone-paved paths which swoop and swerve and dip and climb through villages and farmlands that have hardly changed in centuries. There are bright green terraces of rice paddies, groves of banana trees, tumbling waterfalls and thrilling glimpses of the sharp white summits of the Himalayas against the bright blue sky. We hear birdsong, the rush of mountain streams and the pleasing jangle of bells signalling the approach of a mule train. In addition to its natural beauty, Nepal is also one of the poorest countries in South Asia and ranks 138 out of 169 on UNDP's human development index. This means it is one of the most difficult countries for women in particular to improve their economic status. Riddled by political instability, fallout from the Maoist Uprising or “Ten Years War,” and earthquake aftermath, Nepalese girls seem to be the last to climb out of the rubble. Child labour is a large black mark upon Nepalese society. Boys are seen as the family's financial future and therefore more encouraged to attend school. Thus, over 25 percent of girls work every day, as opposed to 17 percent of boys. Working girls do so to support their families, often in very dangerous conditions. It is not uncommon for them to be junk dealers, sweatshop workers, housekeepers, or weavers, each exposing girls to illnesses without proper health care. Three quarters (76.4 percent) of Nepal’s male population is literate, to the level of a Nepalese high school education. Whereas, only 53.1 percent of women are literate to this same level. There are a few issues that currently rattle the country's infrastructure, including earthquake rehabilitation and a tenuous government. Lesser known is the proliferation of child marriage. Despite the fact that it has been illegal since 1963, Nepal has the third highest rate of child marriage in Asia. Thirty-seven percent of girls marry before 18 years of age. Ten percent marry before they are 15 years old. The legal age of marriage is 20. In 2006, the Nepali government reported that 60 percent of women in this age group were married by the age of 18. Women are considered financially burdensome or "economically inactive" citizens because they do not earn as much as men and often have insufficient education to procure higher paying jobs. Though school itself is free, the cost of books, pencils and paper are often too expensive for families to justify sending their daughters to school. They are often seen as a financial burden to their families until they join a new family in matrimony and begin a family of child workers. Girls often go to work at a very early age. However, uniquely, it is not always the parents pushing their daughters to marry young. Rather, many girls feel a sense of obligation to relieve their parents of having to financially care for them. Out of respect or sense of duty, girls often choose to marry young in the hope it will ease the financial burden on their parents. As a result, young girls are less discriminating of their potential husbands. They often marry the most likely option, many times much older, and bearing children at a very early age. Early childbearing can also cause dangerous health issues. Without proper health care, these issues can dramatically affect the rest of their lives. The Chhetri sisters were fortunate enough to grow up in a very different environment than many of the women in remote Nepalese villages. None of the Chhetri sisters ever felt pressured to marry. In fact, it may have been through the support of their family in which they felt most empowered and encouraged enough to start 3 Sisters in the first place. “It is always a difficult job for a woman to bring some innovative changes into society,” Lucky says, “and [our business] needs a lot of dedication, support and hard work. One has to be really strong to face any kind of terrible situation. So, maybe in our determination and dedication toward our work and empowering the women of our country, we never gave priority to marriage. We three sisters are always there to support each other in every step of our lives.” As of 2017, the only sister to have married is the youngest, Nicky, who got married in 2016. Against doubts and resistance, Lucky, Nicky and Dicky have drawn women of disadvantaged backgrounds to their program. Without much education or experience, the girls arrive wary and anxious at the prospect of a different future. But life as an adventure guide involves some physical and mental hardships as well. These girls have to be quite physically fit and unrelenting in their training. For four weeks they practice technical and conversational english in complex subjects including human rights, environmental concerns and medicine. Additionally, they learn precise protocols for first aid and wilderness survival. Physical training includes physical fitness aptitude, carrying and managing equipment. Students are confronted with new challenges, like how to transport an injured person while caring for them and how to setup and employ equipment, like tents and stoves, never previously seen before. Interestingly, the young women of Nepal are uniquely qualified for this type of training. They are familiar with the remote mountainous landscapes, they are hard working and independent, and they are physically fit given that most women perform manual labor at high elevations on a daily basis. Physical fitness is a core component of trekking guide training. Most tourists prepare to do a single long distance trek or two in a year. For these girls, it is a career. 3 Sisters Trekking hosts trips for guests as short as two-days, navigating viewpoints just outside the city of Pokhara. However, they also host treks as long as 20+ days, like the Annapurna Circuit trek, which can range from 100 to 145 miles depending on access and transportation. Guides are not only trained in wilderness skills but in leadership skills as well. Given Nepal's traditions, it takes time for social and emotional growth. Women must learn to speak up, give instruction and establish themselves as an authority in taxing moments. Between 1999-2017 3 Sisters had trained 2,000 women from 50 districts throughout Nepal. Through their work, the Chhetri sisters hope to see their staff and trainees embrace independence and experience new possibilities at high altitude. To learn more, we sought an exclusive interview with Lucky Chhetri to hear about what training is like, Nepal's caste system and what life is like for the aspiring professionals under their wing. Can you describe the background (age, residence, demographic) of your average student? Many of our female trainees are from remote areas of 53 districts of Nepal- out of 75 districts (excluding most plain areas and the far eastern region), age ranges between 18-35 years old. Many girls belong from a low level family of with no job opportunities and came to learn and earn for them to live independent life. How does being trekking guide give your graduates a different life then they would have otherwise? In our organizations, we have a variation of women working –meaning we welcome all religious, caste or educational background. We have graduates who have perused masters’ degree to some who haven’t been to school ever. This job helps develop their self-confident and independent. In addition they get an opportunity to learn foreign language, chance to get explore to their own country and aboard as well. This professional helps our female guides to get along with many new foreign travelers and share their knowledge on history, geography, culture and many more. This profession also helps women to be strong, bold, fit and healthy which wouldn’t have been possible in other profession. It is one of the good income professions for women. Being a trekking guide is a respectable profession now. You mentioned that many of the women in your program are of low caste. Yes, because Nepal is a country of multiple castes and still there is discrimination between upper caste and lower caste. Because of which lower caste people are more disadvantaged and underprivileged than the upper one. And our mission is to empower disadvantaged women. So that is the reason behind us having more women from backward community. What does this mean in Nepal and what opportunities do these women have? Before stepping in this organization, women were never considered to be a trekking guide. Now those women are into this field and are doing great a job. There are many more trekking agency’s running by women and demand for more women guide. Many women who were involved only in house hold chores or into pickle making or tailoring are now into adventure tourism. How do you know if someone is a good applicant for your program? What qualities do they have? What do your guides have the most trouble learning? Our guides mostly have trouble with learning English. English language considers one of the most sophisticated languages here and our guide belongs to remote areas of Nepal where probably they mightn’t have learn and heard of English language so learning English is quite hard for them. Images of local villagers, temples and 3 Sisters guides. Why did you three decide to do this? What is your background? As our country Nepal has a patriarchal society where only men are in authority and women are just bounded within household works. So, our first and main vision was to empower girls through providing skills about trekking guide as only men were dominating on this field. And we know the potential our Nepali sisters, that if given a chance possibly they can do anything that a man can do. So, with this vision we first established our company 3 Sisters Adventure Trekking in 1998 and became the first company to employ female guides in Nepal. Then we came out with an idea of providing training about trekking guide so we established an NGO; Empowering Women of Nepal in 1999 that only targets disadvantaged girls and women of remote places of Nepal and empower them through the skills provide during training. Empowering Women of Nepal (EWN) and 3 Sisters Adventure Trekking work in partnership to promote and empower women through adventure tourism.3 Sisters Adventure Trekking guarantees field experiences and employ the interested trainees on paid apprenticeship programs. Lucky the elder sister did Master in Geography, Dicky and Nicky have Bachelor degree on business and all of us have additional course in many different areas. Why do most students choose to be guides? It is a free training and have paid apprenticeship program. It is a seasonal job; they can easily carry on their study. They learn language, and many other life skills which help on their study. Most of the girls are from remote areas and their parents couldn’t help them but if they work as a guide they can take care of their whole expenses. On the other hand : Guide is a leader, guardian, teacher, first aider – basically she is a professional where one have knowledge on various things like life skills, places, people, flora and fauna, to deal in the worst situation, and to be physically fit. Any person can be guide and earn handsome money to establish their and their family lives, change the life style, educate them or pursue higher education. After many years of hardship, female guides are respected. So, I think these are the reasons behind the students chose to be guide. Our office is based in Pokhara, on the lap of Annapurna Mountain. range, therefore the typical trek is to go in the Annapurna Mountain areas for a day hike to 20 days trek. As per our training policy, our trainees are first introduced to the trekking/walking as an assistant on the easy route due to the elevation reason and gradually they go for longer trekking in mountain areas. What is the most discouraging aspect of your job or working with the students? This job is really encouraging to all who are directly or indirectly linked with us. During the season time most of the students are busy with their exam which is difficult to fulfill the demand of the clients. Are most students from the region or do they learn the routes in training? Some students are from region but most of the student they learn the routes in practical training because 3 Sisters Adventure Trekking guarantees the on the job training for the field experience. Why have most trekking guides and Sherpas been men historically? As Nepal is a patriarchal country where in many societies men have authority over women in every sectors. And only men were sent to school and always active in any kind of involvement but women were bounded only within household works. And as men are considered more strong physically then women so most trekking guides and Sherpa’s been men historically, now these concepts are changing. How do local Nepalese respond to the program? What do they like or dislike? I think good works are always appreciated by everyone. So, local Nepalese have really good respond towards us. At first they are amazed to hear about our works and influenced about how three Nepali sisters are doing such a great job. They like every work of ours, especially the way we empowered disadvantaged girls through trekking guide profession. Where do most of your graduates go to work after completing your program? As EWN and 3 Sisters Adventure Trekking works in partnership so, most of our graduates work in 3 Sisters Trekking company. And besides than that our graduates are also involved in tourism, adventure tourism and start business. Where did you three grow up? We grew up in Darjeeling; North-East part of India. What prompted your interest in starting this trekking school? We grew up in a big family. When our father expired on 1992, we were in a joint family. Our brothers were not responsible guardian like our father and we started missing him a lot. Then we decided to get away from there and we choose Pokhara as our destination. We started a guest house in Pokhara, in a tourist town. All of sudden our business became popular because it was rare Nepali women run business by their selves. We were enjoying meeting people and learned skills to improve our business. When we heard couple of young women were hassle by male guides during trekking. Then Lucky went to the Annapurna Base Camp to explore the possibilities of women guiding with the Basic Mountaineering knowledge. Lucky has also traveled to remote west Nepal and see the life of rural women. They are lack of education and other opportunity work so hard for nothing. They were very strong physically and fearless to do any activities because of their daily life. So we thought if we can combine these two different activities may work and tried for many years. And now it is became a decent profession for Nepalese women. Can you name one little known quality about each of you? I think we all three sisters have same qualities and same vision. But if it has to be specific then I would say Nicky has the quality of administration and dedication towards work, Dicky has the quality of Public Relation and I (Lucky) have a leadership quality.